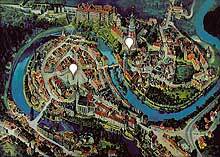 Professionals operating hotels established this web site to offer you best services and prices of Cesky Krumlov hotels online and insight into Cesky Krumlov accommodation. This marvelous city on the bank of Vltava river and its beautiful center area protected by UNESCO is a great oportunity to make adventure into medieval times. Our list of online Cesky Krumlov accommodation offers you guarantee that you wont be disturbed and will provide you with safety of your home in Cesky Krumlov hotels. Explore all romantic corners of Cesky Krumlov and than sleep like in heaven. Charming Krumlov Hotels is guarantee of quality!